Why would I need self storage in Rock Hill, SC? There are a variety of reasons why you might need self-storage in Rock Hill, SC. How much is a storage unit in Rock Hill, SC? The cheapest storage unit in Rock Hill, SC is $32.00 per month. What size storage units do you have available in Rock Hill, SC? In Rock Hill, SC we have sizes that range from 5'x5' to 10'x30' to suit your storage needs. How much is it for a 5'x5' storage unit in Rock Hill, SC? The cheapest 5'x5' storage unit in Rock Hill, SC is $32.00 per month. Rock Hill is the largest city in South Carolina's York County and part of the greater Charlotte metropolitan area. Countless residents and businesses are drawn to Rock Hill each year thanks to its close proximity to Charlotte, advantageous tax laws, lucrative business incentives and award-winning employee training programs. Combined with Southern charm that gives this midsize city a small-town feel, it's no surprise that Rock Hill has been growing at a steady rate. The first major event in Rock Hill's history as a city was the opening of its first official post office in 1852. The surrounding settlement dates back long before that, but it never grew to a substantial size until the railroad arrived in the area. The community's early founding families correctly guessed that a rail depot would help fuel the community's growth, so they agreed to give the railroad company the right of way through their land. At that point, all the settlement needed was a name, so Rock Hill was chosen as a nod to a hill of flint rock that had to be cleared before the railroad could be built. The Civil War had a major impact on Rock Hill, shifting the community away from a rural lifestyle and toward town life. Many returning soldiers worked as merchants, and many of the town's wealthy elite had been forced to sell off parcels of their land in order to avoid going completely bankrupt. 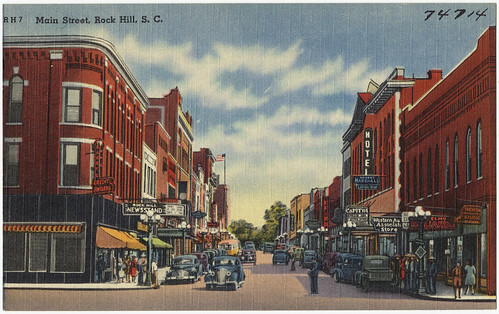 Within the span of several years, Rock Hill had changed quite a bit. In 1870, after three separate attempts, Rock Hill was officially incorporated. Rock Hill boasts big-city amenities and great job opportunities, and is home to a diverse and educated population that enjoys easy access to entertainment venues, shopping, dining and great schools. There are several distinct neighborhoods in Rock Hill, each with its own unique identity and culture. You can choose a neighborhood that fits your lifestyle, whether you're looking for something family-friendly, something with exciting nightlife options or a quiet retirement community. Several museums are located in Rock Hill, featuring art, history, cultural and natural history exhibits. The Main Street Children's Museum, located in the downtown district, specializes in hands-on educational activities for children. A number of local parks offer many recreational activities, including hiking, picnicking, horseback riding and scenic views. Rock Hill schools are part of York County District 3, which offers several focused-learning facilities in addition to its elementary, middle and high schools. There are also several private schools in Rock Hill, mainly faith-based campuses like St. Anne's Catholic School. The city is also home to three college campuses: Winthrop University, Clinton Junior College and York Technical College. Utilities: The city provides electricity, water and sewer services to homes and businesses in Rock Hill. Garbage and Recycling: The trash and recycling services in Rock Hill are assigned based on your home's location. Transportation: York County Access operates two public transportation services in Rock Hill, the Ride-to-Work commuter van and transportation for seniors and disabled citizens. Rock Hill consists of 24 constituent neighborhoods, providing a wide range of options to fit a variety of lifestyles. The housing market is fairly affordable, with a median home price that hovers around the national average. You'll find many housing options, including budget-friendly new construction, rental apartments and up-for-auction fixer-uppers. Our lowest priced units in Rock Hill, SC average $41.50 per month. 131 people have reserved units in Rock Hill, SC in the past 30 days. There are 2 locations within Rock Hill, SC's city limits. There are 2 locations in Rock Hill, SC that offer AC and Heating features.